Popol Vuh (also Popol Wuj or Popul Vuh) is a cultural narrative that recounts the mythology and history of the Kʼicheʼ people who inhabit the Guatemalan Highlands northwest of present-day Guatemala City. The Popol Vuh is a creation narrative written by the Kʼicheʼ people before the Spanish conquest of Guatemala, originally preserved through oral tradition until approximately 1550 when it was written down. The survival of the Popol Vuh is credited to the 18th century Dominican friar Francisco Ximénez who made a copy of the original text in Spanish. The name "Popol Vuh" translates as "Book of the Community", "Book of Counsel", or more literally as "Book of the People". The Popol Vuh includes the Mayan creation myth, beginning with the exploits of the Hero Twins Hunahpú and Xbalanqué. As with similar texts (Chilam Balam, being one example), a great deal of the Popol Vuh's significance lies in the scarcity of early accounts dealing with Mesoamerican mythologies due to the purging of documents by the Spanish Conquistadors. In 1701, Father Ximénez came to Santo Tomás Chichicastenango (also known as Santo Tomás Chuilá). This town was in the Quiché territory and therefore is probably where Fr. Ximénez first redacted the mythistory. Ximénez transcribed and translated the manuscript in parallel Kʼicheʼ and Spanish columns (the Kʼicheʼ having been represented phonetically with Latin and Parra characters). In or around 1714, Ximénez incorporated the Spanish content in book one, chapters 2–21 of his Historia de la provincia de San Vicente de Chiapa y Guatemala de la orden de predicadores. Ximénez's manuscripts remained posthumously in the possession of the Dominican Order until General Francisco Morazán expelled the clerics from Guatemala in 1829–30 whereupon the Order's documents passed largely to the Universidad de San Carlos. From 1852 to 1855, Moritz Wagner and Carl Scherzer traveled to Central America, arriving in Guatemala City in early May 1854. Scherzer found Ximénez's writings in the university library, noting that there was one particular item "del mayor interes" ('of the greatest interest'). With assistance from the Guatemalan historian and archivist Juan Gavarrete, Scherzer copied (or had a copy made) of the Spanish content from the last half of the manuscript, which he published upon his return to Europe. In 1855, French Abbot Charles Étienne Brasseur de Bourbourg also found Ximénez's writings in the university library. However, whereas Scherzer copied the manuscript, Brasseur apparently stole the university's volume and took it back to France. After Brasseur's death in 1874, the Mexico-Guatémalienne collection containing Popol Vuh passed to Alphonse Pinart through whom it was sold to Edward E. Ayer. In 1897, Ayer decided to donate his 17,000 pieces to The Newberry Library, a project that tarried until 1911. Father Ximénez's transcription-translation of "Popol Vuh" was among Ayer's donated items. Father Ximénez's manuscript contains the oldest known text of Popol Vuh. It is mostly written in parallel Kʼicheʼ and Spanish as in the front and rear of the first folio pictured here. Many versions of the legend of the Hero Twins Hunahpú and Xbalanqué circulated through the Mayan peoples, but the story that survives was preserved by the Dominican priest Francisco Ximénez who translated the document between 1700 and 1715. Maya deities in the Post-Classic codices differ from the earlier versions described in the Early Classic period. 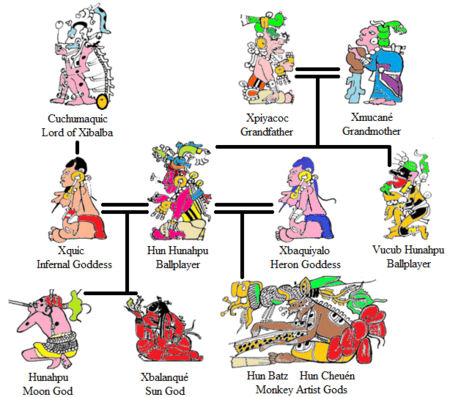 In Mayan mythology Hunahpú and Xbalanqué are the second pair of twins out of three, preceded by Hun-Hunahpú and his brother Vucub-Hunahpú, and precursors to the third pair of twins, Hun Batz and Hun Chuen. In the Popol Vuh, the first set of twins, Hun-Hunahpú and Vucub-Hanahpú were invited to the Mayan Underworld, Xibalba, to play a ballgame with the Xibalban lords. In the Underworld the twins faced many trials filled with trickery; eventually they fail and are put to death. The Hero Twins, Hunahpú and Xblanaqué, are magically conceived after the death of their father, Hun-Hunahpú, and in time they return to Xibalba to avenge the deaths of their father and uncle by defeating the Lords of the Underworld. A family tree of gods and demigods. Introduction to the piece that introduces Xpiyacoc and Xmucane, the purpose for writing the Popol Vuh, and the measuring of the earth. Account of the creation of living beings. Animals were created first, followed by humans. The first humans were made of earth and mud, but soaked up water and dissolved. The second humans were created from wood, but they were washed away in a flood. The Hero Twins plan to kill Vucub-Caquix and his sons, Zipacna and Cabracan. They succeed, "restoring order and balance to the world." The Father and Uncle of The Hero Twins, Hun Hunahpu and Vucub Hunahpu, sons of Xmucane and Xpiacoc, are murdered at a ball game in Xibalba. Hun Hunahpu's head is placed in a calabash tree, where it spits in the hand of Xquiq, impregnating her. She leaves the underworld to be with her mother-in-law, Xmucane. Her sons then challenge the Lords who killed their father and uncle, succeeding and becoming the sun and the moon. Humans are successfully created from Maize. The gods give them morality in order to keep them loyal. Later, they give them wives to make them content. This book also describes the movement of the Kʼicheʼ and includes the introduction of Gucumatz. A visual comparison of two sections of the Popol Vuh are presented below and include the original Kʼiche, literal English translation, and modern English translation as shown by Allen Christenson. among the people of the Quiché nation. Katolonaʼ puch u pa kaj. Be it empty as well its womb sky. and empty is the womb of the sky. The Popol Vuh continues to be an important part in the belief system of many Kʼicheʼ. Although Catholicism is generally seen as the dominant religion, some believe that many natives practice a syncretic blend of Christian and indigenous beliefs. Some stories from the Popol Vuh continued to be told by modern Maya as folk legends; some stories recorded by anthropologists in the 20th century may preserve portions of the ancient tales in greater detail than the Ximénez manuscript. On August 22, 2012, the Popol Vuh was declared intangible cultural heritage of Guatemala by the Guatemalan Ministry of Culture. Since its rediscovery by Europeans in the 19th century, the Popol Vuh has attracted the attention of many authors. For example, the myths and legends included in Louis L'Amour's novel The Haunted Mesa are largely based on the Popol Vuh. The planet of Camazotz in Madeleine L'Engle's A Wrinkle in Time is named for the bat-god of the hero-twins story. The text was also used by German film director Werner Herzog as extensive narration for the first chapter of his movie Fata Morgana (released 1971). Mexican painter Diego Rivera did a series of watercolors in 1931 as illustrations for the book. In 1934, the Franco-American early avant-garde composer Edgard Varèse wrote his Ecuatorial, a setting of words from the Popol Vuh for bass soloist and various instruments. The Argentinian composer Alberto Ginastera began writing his opus 44 symphonic work Popol Vuh in 1975 but left the work incomplete at his death in 1983. In Munich, Germany in 1969, keyboardist Florian Fricke—at the time ensconced in Mayan myth—formed a band named Popol Vuh with synth player Frank Fiedler and percussionist Holger Trulzsch. Their 1970 debut album, Affenstunde, reflected this spiritual connection. The band is notable especially for its extremely early experimentation with forms that became popularized through the modern electronic, new age/ambient music that was to follow years later. They also collaborated with Werner Herzog on five of his movies. Another band by the same name, this one of Norwegian descent, formed around the same time, its name also inspired by the Kʼicheʼ writings. Contemporary archaeologists (first of all Michael D. Coe) have found depictions of characters and episodes from Popol Vuh on Mayan ceramics and other art objects (e.g., the Hero Twins, Howler Monkey Gods, the shooting of Vucub-Caquix and, as many believe, the restoration of the Twins' dead father, Hun Hunahpu). The accompanying sections of hieroglyphical text could thus, theoretically, relate to passages from the Popol Vuh. Richard D. Hansen found a stucco frieze depicting two floating figures that might be the Hero Twins at the site of El Mirador. Following the Twin Hero narrative, mankind is fashioned from white and yellow corn, demonstrating the crop's transcendent importance in Maya culture. To the Maya of the Classic period, Hun Hunahpu may have represented the maize god. Although in the Popol Vuh his severed head is unequivocally stated to have become a calabash, some scholars believe the calabash to be interchangeable with a cacao pod or an ear of corn. In this line, decapitation and sacrifice correspond to harvesting corn and the sacrifices accompanying planting and harvesting. Planting and harvesting also relate to Maya astronomy and calendar, since the cycles of the moon and sun determined the crop seasons. 1857. Scherzer, Carl (ed.). Las historias del origen de los indios de esta provincia de Guatemala. Vienna: Carlos Gerold e hijo. 1861. Brasseur de Bourbourg; Charles Étienne (eds.). Popol vuh. Le livre sacré et les mythes de l'antiquité américaine, avec les livres héroïques et historiques des Quichés. Paris: Bertrand. 1947. Recinos, Adrián (ed.). Popol Vuh: las antiguas historias del Quiché. Mexico: Fondo de Cultura Económica. 1950. Goetz, Delia; Morley, Sylvanus Griswold (eds.). Popol Vuh: The Sacred Book of the Ancient Quiché Maya By Adrián Recinos (1st ed.). Norman: University of Oklahoma Press. 1971. Edmonson, Munro S. (ed.). The Book of Counsel: The Popol-Vuh of the Quiche Maya of Guatemala. Publ. no. 35. New Orleans: Middle American Research Institute, Tulane University. OCLC 658606. 1973. Estrada Monroy, Agustín (ed.). Popol Vuh: empiezan las historias del origen de los índios de esta provincia de Guatemala (Edición facsimilar ed.). Guatemala City: Editorial "José de Piñeda Ibarra". OCLC 1926769. ^ Christenson, Allen J. (2007). Popol vuh : the sacred book of the Maya (Oklahoma ed.). Norman: University of Oklahoma Press. pp. 26–31. ISBN 978-0-8061-3839-8. Retrieved 29 September 2017. ^ a b c "Popol Vuh AHA". www.historians.org. American Historical Association. Retrieved 3 November 2017. ^ "Popol Vuh - The Sacred Book of The Mayas". www.vopus.org. VOPUS. Retrieved 3 November 2017. ^ Christenson, Allen J. (2007). Popol vuh : the sacred book of the Maya (Oklahoma ed.). Norman: University of Oklahoma Press. p. 64. ISBN 978-0-8061-3839-8. Retrieved 3 November 2017. ^ Christenson, Allen J. (2007). Popol vuh : the sacred book of the Maya (Oklahoma ed.). Norman: University of Oklahoma Press. p. 21. ISBN 978-0-8061-3839-8. Retrieved 3 November 2017. ^ Woodruff 2009 pp. 46–47. Brasseur mentions Ximénez's Popol Vuh manuscript in three different works from 1857–1871, but never explicitly states the library document as the source of 1861 French edition. See Histoire des nations civilisées du Mexique et de l'Amérique-Centrale (1857), Popol vuh. Le livre sacré (1861), and Bibliothèque Mexico-Guatémalienne (1871). It was not until fifteen years after his return to Europe that Brasseur suggested a specific provenance of his source material and then asserted that it had come from Ignacio Coloche in Rabinal. The inconsistency among his statements led Munro Edmonson (1971) to postulate that there had been multiple manuscripts in Guatemala. ^ After the list of rulers, the narrative recounts that the three Great Stewards of the principal ruling Kʼicheʼ lineages were "the mothers of the word, and the fathers of the word"; and the "word" has been interpreted by some to mean the Popol Vuh itself. Since a prominent place is given to the Kaweq lineage at the end of Popol Vuh, the author / scribe / narrator / storyteller may have belonged to this lineage as opposed to another Kʼicheʼ lineage. ^ "Popol Vuh Newberry". www.newberry.org. The Newberry. Retrieved 3 November 2017. ^ Christenson, Allen J. (2007). Popol Vuh : The Sacred Book of the Maya. Norman, OK: University of Oklahoma Press. pp. 59–66. ISBN 978-0-8061-3839-8. Retrieved 19 October 2017. ^ a b c d e f g h i j k l "Popol Vuh". Ancient History Encyclopedia. Retrieved 10 November 2017. ^ a b c d e Christenson, Allen J. "POPOL VUH: LITERAL TRANSLATION" (PDF). Mesoweb Publications. Retrieved 19 October 2017. ^ Christenson's edition is considered the most up-to-date version of the Popol Vuh. ^ Christenson, Allen J. (2007). Popol vuh : the sacred book of the Maya (Oklahoma ed.). Norman: University of Oklahoma Press. p. 59. ISBN 978-0806138398. Retrieved 3 November 2017. ^ a b Bold and capitalized letters are taken directly from the source material. ^ Christenson, Allen J. (2007). Popol Vuh : The Sacred Book of the Maya. Norman, OK: University of Oklahoma Press. p. 59. ISBN 978-0-8061-3839-8. Retrieved 19 October 2017. ^ a b Text has been broken in logical places to parallel the poetic structure of the original text. ^ Christenson, Allen J. (2007). Popol Vuh : The Sacred Book of the Maya. Norman, OK: University of Oklahoma Press. p. 67. ISBN 978-0-8061-3839-8. Retrieved 19 October 2017. ^ MultiCultural Review, Volume 9. GP Subscription Publications. 2000. p. 97. Retrieved May 17, 2014. ^ Dennis Tedlock (2013). Popol Vuh: The Mayan Book of the Dawn of Life. eBookIt.com. ISBN 1456613030. Retrieved May 17, 2014. ^ Amlin, Patricia (2004). "Popol vuh". WorldCat. Retrieved 27 November 2017. ^ "The Popol Vuh". YouTube. Retrieved 27 November 2017. ^ Publinews (25 August 2012). "Popol Vuh es declarado Patrimonio Cultural Intangible". ^ "Video News". cnn.com. October 14, 2009. ^ "Video News". cnn.com. November 11, 2009. ^ "Breaking News, Latest News and Videos". cnn.com. Wikimedia Commons has media related to Popol Vuh.